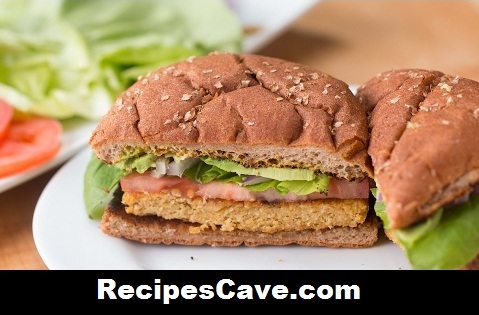 Carrot & Chickpea Veggie Burger Recipe - Best burger recipe for vegetarian people who love to taste with vegetables. This veggie burger is made with carrots that is healthy and tasty. If you don't love chicken burger and beef burger then this vegetable burger is recommended to taste. 1. In a food processor, combine chickpeas, oats, carrots, red onion, egg, salt, pepper, garlic powder, and olive oil. Blend just until combined. 2. Add lemon juice and blend again until well-combined. 3. Scoop the mixture using a ⅓ cup measuring cup and form patty in your hands. 4. Heat a tablespoon of olive oil over medium-high heat. Cook the patty 4-5 minutes on each side, or until golden brown. 5. Assemble with your favorite burger toppings. your Carrot & Chickpea Veggie Burger Recipe is ready to taste.